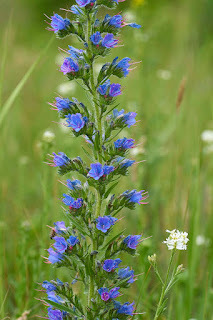 Viper's Bugloss (Echium vulgare) is called "der Naaderkopp" in Deitsch. The plant is native to Europe but is naturalized in the Deitscherei. Likely due to the Doctrine of Signatures that associates the spotted stem of the plant with the skin of a viper and the prickly leaves with the bite, the traditional Deitsch use of the herb was to remove snake venom and to prevent viper bites. Due to the pyrrolizidine alkaloids, the plant is potentially toxic to the liver, so internal ingestion is not recommended. The plant, though, is still used in sympathetic Hexerei to hex snakes in order to weaken them and their venom. The whole plant is burned to curse any biting snake. The juice of the plant is splattered on snake bites along with some expulsion curses and charms. There are three venomous pit viper species in Pennsylvania: Northern Copperhead, Timber Rattlesnake, Eastern Massasauga. On the plus side, though, the power of the viper may also be applied using Viper's Bugloss in a salve for "biting" boils, carbuncles, and other skin growths. The plant is safe for external use. As is the case with the stories of many cultures, Deitsch lore makes references to charming snakes. However, there is also a belief that snakes can charm other creatures. Snakes are said to charm birds so that they fly in lower and lower circles until they are eventually caught by the snake. Snakes can charm humans, too. A human who is charmed is said to be "gebannt," which is usually the result of a human and a snake meeting each other's gaze. One way to break the charm is to burn Viper's Bugloss and to smudge the animal or the person with the smoke of the herb. 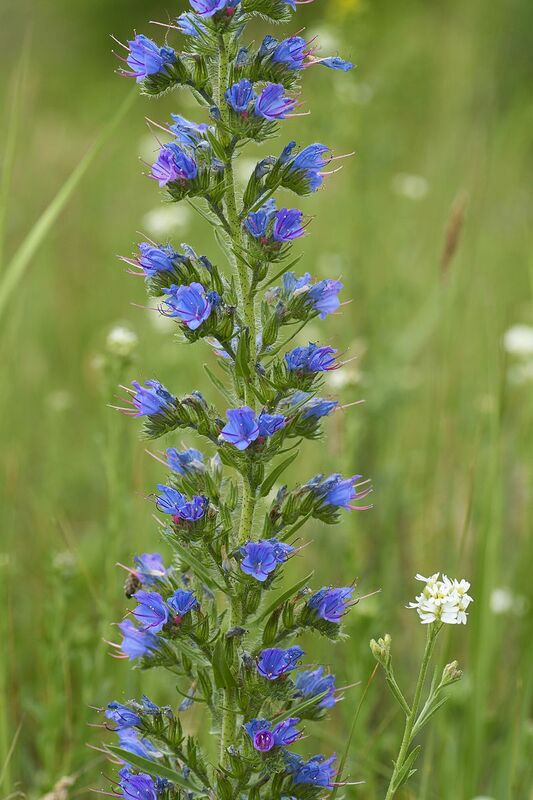 There is also a belief that stands of Viper's Bugloss appear where a snake has killed prey.